Tone Up & Stress Down-Without Pricey Lessons: Unlike typical yoga mats, ours comes printed with detailed, diagrams demonstrating each pose. Perfect your asanas at home… no trainer needed. 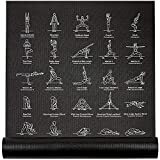 Beginners Love It: At 24″ x 68″, our large yoga mat is great for both men and women. Crisp, clear illustrations take the guesswork out of popular poses and makes self-guided sessions a breeze. Non Slip, with Just the Right Thickness: Our 5mm thick yoga mat provides the ideal amount of padding to allow for comfort and proper balance. The slightly tacky surface keeps hands and feet stable. Special Earth-Friendly Material: Your easy yoga mat is made from a special type of PVC that’s free of chemicals that other mats have. No phthalates, with a light odor that quickly dissipates. 100% Money-Back Guarantee: If you aren’t thrilled with your yoga exercise mat, send it back to us for a full, hassle-free refund. We want you to be completely satisfied with your purchase.